Today on the Doc On The Run Podcast we’re talking about how runners with severe cases of Achilles tendinitis keep running without surgery. Just to make sure you understand the difference we will briefly discuss each of the different forms of Achilles tendon problems that can afflict runners. Achilles Tendinopathy is a useless, but official-medic-sounding term meaning something is wrong, diseased, or “pathologic” with the Achilles. But because it doesn’t tell you what is really wrong with the tendon, it does not help you at all determine what you should do to fix it. The earliest form of Achilles tendon trouble is Achilles Paratendinitis. This means you have inflammation surrounding the tendon, but no inflammation within the actual tendon itself. In cases of Achilles paratedinitis, there is inflammatory fluid accumulating between the Achilles tendon and the paratenon or the thin outer layer surrounding the tendon. 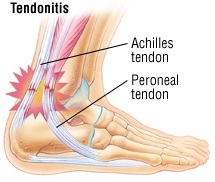 Achilles tendinitis is inflammation within the tendon itself. Achilles tendonosis is degeneration of the collagen that makes up the tendon. It is caused by chronic inflammation and irritation of the substance of the tendon. As it progresses, the fibers of the tendon start to become disorganized. They become weaker and more prone to microscopic tears. Over time, the tearing of the Achilles tendon can progress and become weaker. It then becomes prone to rupture or complete tearing. In some cases, the Achilles tendon may rip away from its attachment at the back of the heel bone. If you notice a lump or firm knot in the back of the Achilles tendon just above the heel bone, this is most likely due to the development of Achilles tendonosis. It may or may not be painful if you squeeze it. Because this sort of mass in the Achilles tendon is usually degeneration that makes the tendon weaker, it is very important that you seek treatment to avoid further damage to the tendon. The first thing to realize is Achilles tendons in runners don’t rip, rupture or tear without first developing tendinosis. In the entire history of the medical literature there has never been a reported case of a ruptured Achilles tendon in a runner who did not have all of the histopathologic (or microscopic) findings consistent with tendinosis. This is the main reason it SO IMPORTANT to arrest Achilles tendon problems early! Collagen fibers are straight linear strands. Collagen bundles are big groups of fibers. The Achilles is made up if many collagen bundles. The tendon is structurally similar to the cables supporting the Golden Gate Bridge. You have a bunch of tiny individual wires, all bundled together, running the entire length of the bridge. Together, they support the weight of the bridge. When you get either chronic repetitive trauma (as in over-use or over-training injuries) you can start to exceed the load the fibers can tolerate. Some of them may tear. If you get chronic inflammation, the inflammatory fluid marinating around those collagen fibers will weaken them. When the collagen fibers in the tendon get weak, they start to tear. So a partial tear in the Achilles tendon just means that some section of collagen bundles have started to tear. However, at least some of the Achilles tendon is still intact and working normally (even though it may hurt). A complete rupture is simple: the entire Achilles tendon rips apart. To a runner, a ruptured Achilles tendon is one of the very worst possible injuries. We can treat it. We can sew it back together. Sometimes we can get it to heal without surgery, but the runner will never be the same. 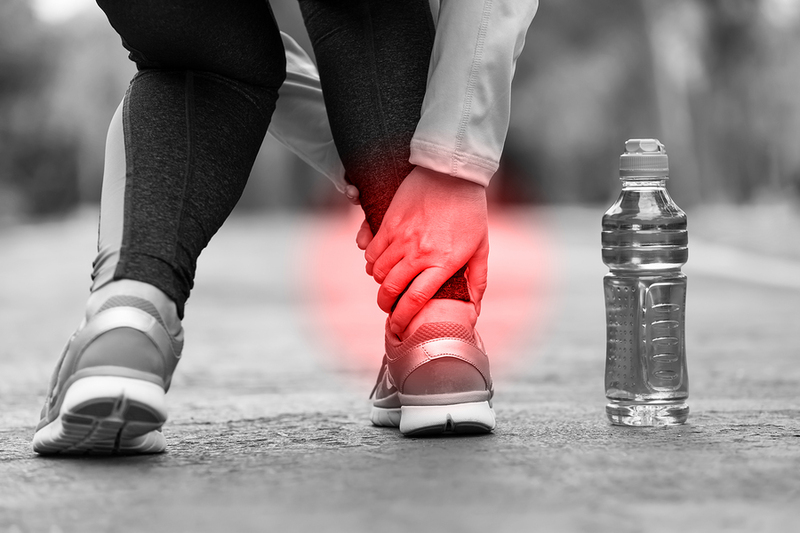 So again, you have to avoid those early Achilles tendon problems, the paratendinitis, tendinitis and tendinosis that all precede an actual Achilles tendon rupture. 1.) What causes achilles tendinosis? There are basically two schools of thought regarding the development of Achilles tendinosis. One group argues that tendinosis is caused by chronic inflammation. The idea is that we know inflammatory fluid contains degradative enzymes which weaken collagen. Because the Achilles tendon is nothing but a huge cable made up of collagen, individual strands or collagen fibers can become week and then rupture individually. Each individual torn fiber no longer supports any load. That load gets transferred to the other fibers. Since the other fibers are under higher tension at that point they become strained and more prone to rupturing as well. Instead, those doctors argue that it’s really repetitive trauma. If you run and train, in any way that applies the same abusive forces, with increasing frequency and without enough time for your body to repair any tissue damage before you subject that tissue to the next damaging workout, you can rupture some of those fibers in the Achilles tendon. But as we mentioned, if you rupture some of the fibers of the Achilles tendon then the neighboring fibers have to take over and absorb that load. If you pull a rubber band tight and then cut it, you will notice it contracts. All of these little ruptured fibers kind of ball up as they tear and retract. All of those little ruptured, retracted, balledup collagen fibers contracting in a confined space within the tendon cause little knots or lumps. Anytime a doctor looks at a runner who is complaining of Achilles tendon issues the doctor will examine the patient. If the doctor feels any lumpy, increased thickness of the Achilles tendon in the watershed region an inch or two above the attachment to the heel bone, the very first thought to consider should be a Achilles tendinosis. Achilles Pain: you have an ache, stiffness, soreness or tenderness in the Achilles’ tendon anywhere between the heel bone and calf muscle at the back of the leg. In its early stages, you may only notice this pain when you run. Or it is possible that you will only notice some soreness in the back of the leg when you get out of bed, early in the morning. Many people will ignore this pain because the soreness seems to disappear as the day goes on once they start walking. However, runners will often notice that this pain hurts more and the soreness returns in the middle of their long runs and speed workouts. Achilles Tenderness: You should never have any pain or tenderness when you press along the Achilles’ tendon anywhere. If you press anywhere along the course of the tendon and you have anything ranging from mild tenderness to intense pain, this should be concerning. Achilles Deformity: The Achilles’ tendon is normally firm and perfectly smooth. If you feel any lump, bump, knot or nodule anywhere along the tendon, this is not normal. Achilles’ tendonosis is the most common reason for these types of abnormal changes in the tendon. However, there are other problems that can cause these deformities such as a ganglion cyst or other tendon tumors. How does Achilles Tendinitis feel in the morning, first few miles, last few miles, post-run? In cases of mild Achilles tendinitis, it may feel sore, or stiff when you first get out of bed and start walking. If the problem is mild it may start to loosen up and then feel better. But most cases of Achilles tendonosis in runners seem to ache without much reprieve. Runners just don’t notice it as “normal patients” much because runners have a high pain threshold. Achilles tendinosis will most likely bother you whenever you are running. In general, the more severe the problem the more it will hurt when running. Most patients with Achilles tendinosis complain that the Achilles tendon is stiffer, more tender and much more sore on the mornings following their days of running. This generally correlates with the intensity of the workout. So an easy slow run won’t produce as much soreness the next day as would a high intensity tempo run or speed work or hill repeats, for example. Are there any tests runners can do to determine this is the pain/issue they’re having? I can look at and determine whether or not they are likely to have Achilles tendinosis. Most runners don’t need expensive tests to make the diagnosis. X-rays are not useful in making a diagnosis of Achilles tendinosis, so I think they are a waste of time. An ultrasound or MRI can be useful in the sense that it gives you a bit more information about the extent of the damage to the Achilles tendon. Many doctors will say that you need to have an MRI to tell whether or not you have Achilles tendinosis versus a partial rupture of the Achilles tendon. This is an interesting point. I have a little bit different take than some doctors. Many doctors seem to want to be able to put people in very specific well-defined boxes. After all, it makes it a lot easier to treat people if you can give everybody within one box the same treatment protocol. But I disagree with this entire premise. We are all individuals. We all have different levels of fitness. We all have different levels of flexibility. We all have different nutritional deficits. We all heal differently. Aside from that, one of my main contentions with Achilles tendinosis is that it’s not just degeneration of the Achilles tendon. It’s basically a whole bunch of different microscopic partial ruptures of the Achilles tendon that cause the lumpiness and weakness in the tendon. So in my mind, if you have Achilles tendinosis, you probably have at least some minor partial tear of the Achilles tendon. I don’t think you need an MRI to tell you that. The only time it may be worth getting an MRI is in those cases when you suspect there’s actually a large partial tear of the Achilles tendon. Because that might alter the treatment recommendation, it may be worth getting an MRI. An interstitial tear is basically a small rip within the substance of the Achilles tendon. If present, you couldn’t see it by looking at the outside surface of the Achilles tendon. You might be able to see it on an MRI. Imagine if you took a large rubber band and you stretched it over and over. Then you stretch it out as much as you can and hold it up to the light. If you looked closely, you might see little wavy sections within the rubber band where a tiny section of the rubber band had torn. But those torn sections are actually contained within the rubber band itself. They are on the inside. You can’t feel them on the surface. That is an interstitial tear. But if the rubber band was cut at the edge, that’s what doctors think of as a real partial tear. If you pull hard enough on that rubber band that has a torn edge, eventually it will rip all the way across. And that of course is what doctors think of as a complete tear or a complete rupture of the Achilles tendon. If you think you have a complete rupture of the Achilles tendon there’s no need for an MRI. You simply have to decide whether or not you will treat the problem with surgery or without surgery. An MRI will not really be helpful in determining which treatment would be best for you as a runner. Regardless of whether or not you have Achilles tendinosis or a small partial tear of the Achilles tendon, the real task is to figure out whether or not you can improve with simple home treatments. If not, you’ll need some sort of advanced treatment to kick off the healing process and get you moving in the right direction. 1. Reduce the stress, prevent inflammation, stretch and see if it calms down. All doctors agree that Achilles tendinitis and tendinosis are different. So it stands to reason they should be treated differently. However many doctors will recommend patients with Achilles tendinosis attempt the conservative treatments which most often work for Achilles tendinitis. Although you may be scratching your head wondering why, the truth is many patients with Achilles tendinosis will improve if they do all of the simple treatments that usually work for Achilles tendinitis. If you have too much stress on the Achilles tendon and it’s producing inflammation, then those treatments will work. In that case you could simply review Part 1 of this series on Achilles tendinitis home treatments and try it. If you improve, obviously you are on the right track. The only thing you would have to do in addition to those simple treatments is add eccentric stretches to the regimen. Eccentric Stretches are the most commonly prescribed home treatment for Achilles Tendinosis. The idea with eccentric stretches is that you gently lower your heel down to apply body weight tension to the Achilles tendon. The theory is that deliberately stretching the Achilles tendon under bodyweight will help realign the collagen fibers and remodel the Achilles tendon to restore it to a more normal state. 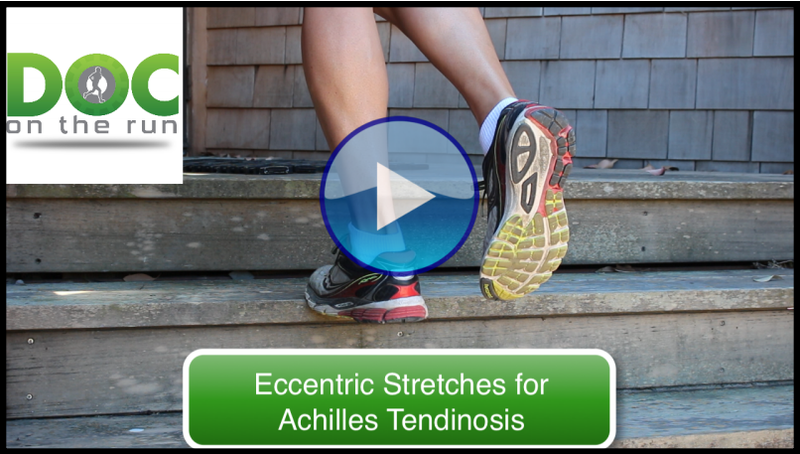 How to do the Eccentric Stretches for Achilles Tendinosis. For simplicity and clarity the following instructions explain how to do the eccentric stretches for Achilles tendinosis affecting the RIGHT Achilles tendon. This assumes you have no problems at all with the left Achilles tendon. To do the Achilles tendon eccentric stretches you will need a stairwell with handrails. You also need to wear reasonably stable supportive running shoes. DO NOT do the stretches while barefoot or while wearing minimalist running shoes! Find a stairwell in your home that has hand rails on both the right and left sides of the stairs. You will need to be able to hold on for balance. Hold onto the hand rails for balance. You should be facing up the staircase. Your back should be toward the descending flight of stairs. Place both feet side-by-side on the edge of the same step. Stand with the balls of the foot on the edge of the step. Your heels should be hanging off of the step. Using your upper body strength and your left foot lift your weight so you are standing up on your toes. Slowly lower your right heel. Keep lowering your right heel until it is all the way down below the edge of the step. You want to lower your body weight gradually. It should take 10 seconds the lower completely. Once you lower all the way down so that your heel is below the edge of the step, hold the stretch and count to five. Place your left foot back on the edge of the step, next to your right foot. Using your upper body strength and your left foot lift your weight so you are standing up on your toes. You do not want to use your damaged Achilles tendon to lift your body weight backup from the lowered heel, stretched out position. Make sure use your left foot and your upper body strength to get you back up onto your toes again! Repeat the eccentric stretch until you have completed 10 cycles. Do this stretch 3 times per day. The eccentric stretching routine, combined with icing, elevation, using a heel lift to decrease stress to the tendon when you’re walking around during the day, can all be very effective in reduce the pain associated with Achilles tendinosis. Because most doctors will recommend trying this home treatment anyway, it would seem reasonable that runners with Achilles tendinosis should try this on their own. If you do not improve, or have not improved with the standard conservative treatments you may need more advanced therapies to stimulate healing of the damaged tendon. One of the oldest advanced therapies is extracorporeal shockwave therapy (also know as ESWT). This treatment utilizes high energy ultrasound shockwaves to traumatize the tissue, convert the chronic wound state that isn’t healing to an acute wound environment that can heal. There are two different forms of extracorporeal shockwave therapy. Low energy extracorporeal shockwave therapy is one that requires no anesthesia because it is not painful. It typically also requires many multiple treatments performed in the doctor’s office. 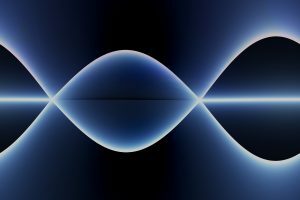 High-energy extracorporeal shockwave therapy requires anesthesia…because it uses more energy, and it hurts. I personally only perform high-energy extracorporeal shockwave therapy. I inject local anesthesia to make the area numb. Yet in spite of this, some patients still have pain during the procedure. It takes about half an hour to deliver 3200 shockwave impulses to the damaged Achilles area. Basically high energy ESWT creates microscopic holes through the Achilles tendon and its attachment to the heel bone. Most patients will have bruising and swelling after the procedure. All this trauma stimulates healing. But if all goes well, all of that trauma converts the damaged degenerated Achilles tendon, which has been stuck in a state of chronic inflammation and a state of non-healing, into a state where the tendon can actually heal. If you ask all your running buddies who have had Achilles tendinitis about different treatments, you’re almost certain to find someone who is had shock wave treatment. Most insurance companies will no longer pay for extracorporeal shockwave therapy but some doctors still offer it. The main inconvenience of this procedure is that it has to be performed in a doctors office. It is also expensive, ranging in price from $1,100 to $2,500. Platelet Rich Plasma (sometimes called “autologous platelet concentrate” or “PRP” for short) is a therapeutic injection which uses your body’s own natural healing cells to repair the tendon. A small sample of blood is drawn from the patient and the healing factors found in the platelets are concentrated in a centrifuge. The platelets contain all of the growth factors needed to unlock the healing process. By injecting the concentrated growth factor solution right into the damaged Achilles tendon, a powerful healing response can be stimulated. This can be done in your home or office. No hospital or surgery required. I personally have had very good results with PRP injections for runners with Achilles tendinosis. Before I continue, I am obligated to tell you that my results are not typical. The results which I’m going to discuss here are not typical of most doctors. The fact that I have had very good outcomes with most of the runners I’ve treated with PRP injection is not an indication that you will do well if you have the same PRP therapy. I should also tell you that I am openly criticized frequently at medical conferences when I lecture and discuss my treatment results and outcomes. Many doctors accuse me of “cherry-picking patents.” I cannot offer a guarantee that you will do as well as most of my patients. In fact in the state of Texas it is illegal for physicians to offer a guarantee of improvement to a patient. As of the date of this writing, I have only had one (1) patient with Achilles tendinosis who reported anything less than 100% full activity (defined as resuming full Ironman/marathon training or getting back to their desired running level of activity). The truth is, I do “cherry pick” patients. I have a unique practice. I only see runners and triathletes. I only see patient who are healthy, active, and physiologically primed to heal. If there is any reason why I believe I have phenomenal outcomes it is not because of me. It is because I treat very healthy patients. Because most of my patients are runners or triathletes they are used to being coached and they’re used to following a plan and working toward a desired outcome. We work together to come up with a plan that work best for each individual. The patients I see heal because they are the right ones to treat with those procedures. They are healthy runners and they follow directions. They don’t heal because my equipment or technique is necessarily better than any other physician anywhere in the country. Dry Needling is another procedure which attempts to use the same principles as a PRP injection. The only difference is we don’t inject any PRP. We basically just poke a bunch of holes in the Achilles tendon with a small needle. If you think about the way extracorporeal shockwave therapy makes numerous holes through the tendon and traumatizes the tendon, you might understand how dry needling could bring about a similar healing response. In theory, I understand how this works. But in practice I don’t generally do it because I think it is worth adding all of those growth factors and co-factors for healing contained within the platelets, as long as we are going to poke a needle through the tendon. 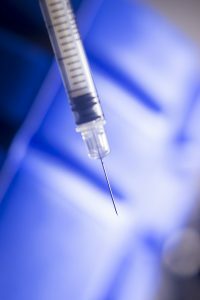 Stem Cell Injections are another, newer type of therapeutic injection. 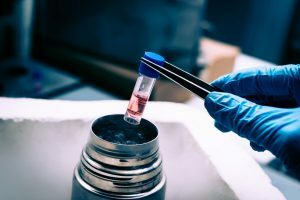 Some websites, articles and even television programs have painted a picture of stem cells implying when we inject stem cells they transform into every different type of cell in the body and then transform into that particular type of tissue. This may be true in the developing fetus, but it’s not really true in adults. It is more accurate to say that stem cells have a powerful healing effect by directing the healing process. Stem cells migrate to the site of an injury and express growth factors at that site of injury which direct healing. Based on that idea it seems stem cells could be extremely helpful in getting a diseased tendon to begin to heal. The type of stem cell injection I typically do for Achilles tendosis, for small partial tears in the tendon, comes from amniotic fluid which can contain many multiples of the amount of stem cells available if we harvest them from an adult patient. The disadvantage of amniotic stem cell injections is that the stem cells come from a donor and they’re slightly more expensive. They have to be ordered the day before your procedure, shipped on ice and then promptly injected into the tendon. So they’re a little more expensive. Another disadvantage of stem cell injections is that there is a little bit more experimental, because they are newer than PRP injections. But there are a couple of advantages to stem cell injections. In theory, they actually have more powerful healing potential then a PRP injection. In addition, since they come from a donor source, we don’t have to draw the blood out of your arm, which is also a bonus. When considering PRP injections or stem cell injections, they both work in very similar ways. There are slight advantages and disadvantages to each. But it’s important to discuss the options with your doctor so you can decide which of these injections will be best in your case, with the amount of tendon damage you have. Just make sure you explain your running goals and your timeline so you and your doctor can determine if a stem cell injection or PRP injection might actually be best for you, in your particular case. Surgery is the best treatment… only when no other treatment will work. 1. I can guarantee you will get a scar. 2. I can guarantee you’ll get a bill. Surgery is by far the riskiest treatment. If I cut you open, you will never be the same. I will change your anatomy with my scalpel. Because your anatomy changes, the rules change as well. After surgery, some of the treatments which might have worked for you, might not work at all. But if you have tried everything else and everything else has failed, then surgery might become an option. There are a couple of reasons why Achilles tendon surgery may actually get you back to running. It might help if you understand what we actually do in surgery. The first thing is that we tell you we are repairing the Achilles tendon. And when we say “repairing it” we don’t take out broken pieces and put in new healthy pieces. We just cut out everything that’s diseased, damaged or looks abnormal. Normal Achilles tendon fibers are made of collagen and they actually look like very thin blond hairs. If we pick at the collagen fibers with a scalpel or a dental pic or some sort of sharp instrument, we can peel out these tiny little fibers that looks like very fine blond hair. But when you have Achilles tendinosis and we pick at it with an instrument, it looks just like string cheese. So basically we peel out all of the string cheese and then sew the tendon back up. We usually use strong non-absorbable suture. Although thick permanent suture can increase the strength of the tendon, it also makes the surgically repaired Achilles tendon less stretchable. Less stretch, less pliability means that the Achilles tendon can less dynamically absorb force. And just like landing as a heel striker versus landing as a mid-foot strike, absorbing forces over a shorter distance increases the peak force or jarring force to the tendon. That increase in peak force may contribute to your risk of other injuries later. The other thing that happens in surgery is that we have to get to the tendon itself. So we have to cut through the paratenon. One time when I was lecturing running injuries, I had an interesting discussion with a brilliant surgeon who was actually the previous president of the American College of Foot & Ankle Surgeons. We were talking about why it is that some runners can actually get back to running after they have Achilles tendon surgery. Is it really the damage in the tendon? Is it because we remove the damaged area? Is it because we repair and strengthen the tendon? Or is it something else? What the surgeon said to me was very interesting. That doctor actually explained that when we open the paratenon in surgery, and we run our finger up and down the back of the tendon, sides of the tendon, to separate the Achilles tendon from the paratenon that covers the tendon, we rip away all of those teeny little nerve fibers. These are the same nerve fibers I believe cause pain in the initial phase of Achilles tendon injury known as paratendinitis. Because when you get peritonitis the fluid stretches the paratenon covering the Achilles tendon away from the Achilles tendon. That tension on those little nerve fibers is what I think causes the initial weird sensations, squeezing sensations, and early forms of mild aching pain around the Achilles tendon. So we both agree that surgery can denervate the Achilles tendon. It may just be that when you have surgery on the Achilles tendon we remove the nerve fibers that tell your brain you have a problem. Because you are no longer getting pain, even if there is some damage to the tendon, you don’t develop inflammation in response to that pain. It would be interesting if we could do a clinical trial or study where patients or runners with Achilles tendinosis were randomized to two different groups. One group of runners with tendinosis would gets the surgery where we just strip away the nerve fibers between the Achilles tendon and the paratenon covering the tendon. The other group of runners with tendinosis would get the actual Achilles tendon repair. 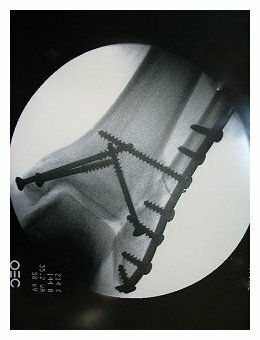 It would be interesting to see if there would be any difference between the two groups of runners after surgery. Although it may seem interesting from an academic standpoint, you are never going to enroll in a study like that. The bottom line is that you need the least invasive, most effective treatment that will work in your case. You need to figure out what ever it is that will get you on the road to healing and back to running as quickly as possible. What do I have to lose by trying to simple treatments first? Would it really matter if I spent a few weeks trying all of the treatments that might help milder forms of Achilles tendon problems? Can I spend a week or two trying the treatments we talked about in Part 1 of this series? If you try those things, you might get a little bit of improvement. If the tendon calms down, then you could add the eccentric stretches and see if you really start to improve. If you do, then you know you are on the right track. But if you do the simple treatment and you are not improving you have to think about advanced therapies. You might need to consider PRP injection. You might need to consider a stem cell injection. But hopefully you will never need to consider surgery. If your doctor offers surgery as one of the first options, be wary. Get a second opinion. Remember, the rules change after you have surgery. Make sure your doctor routinely works with runners. 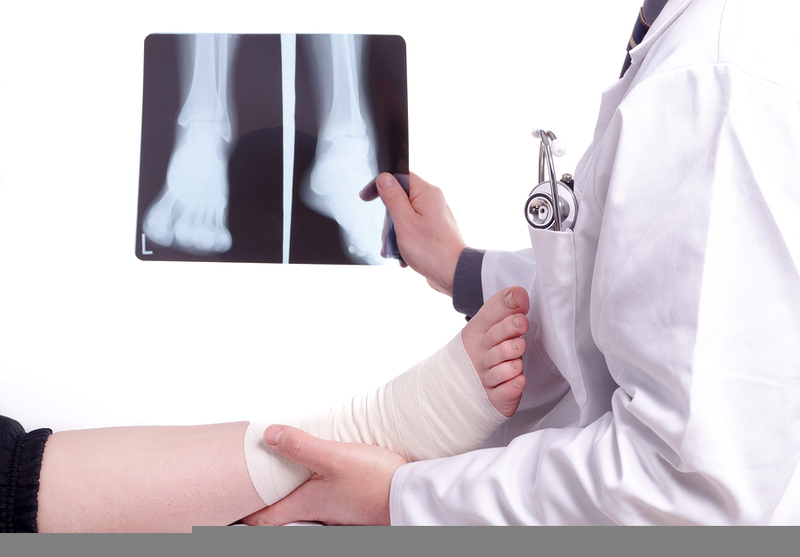 Make sure your doctor knows you plan to continue to run after your Achilles tendon heals. You and your doctor need to be on the same team. If you, your doctor, your coach, if everyone is aligned with the goal of you getting back to running as quickly as possible, there’s always a solution. You just have to find the right solution for you.